Fifty years after it ceased publication Flair is still one of the most talked-about and inventive magazines ever created. Its production and artistry were outstanding, and under the editorial leadership of the enigmatic Fleur Cowles it was credited with is covering many new writers and artists long before they achieved fame and fortune. The Best of Flair brings together all the extraordinary features of the magazine, including the best pieces on art, travel, society literature, fashion & design from the original twelve issues and a selection of the famous die-cut covers, foldouts & self-contained booklets. 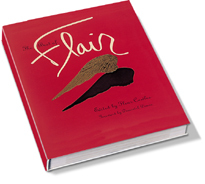 Back in print due to overwhelming demand, The Best of Flair is the most prestigious gift book of the season.